» Beware of fake virus scam! » Are NFL Games Fixed? There is a virus/Malware going around that is hijacking members browsers. We are not the only forum having this issue from our provider. Several members have reported the issue. What appears to happen is your browser (Chrome, IE, Firefox, Safari on Mac) gets taken over and a message is posted that you have a virus and to please contact the following number. DO NOT call the number, DO NOT ever let anyone take control of your computer. This is a scam. They will include the name of Microsoft, your internet supplier (ATT, Time Warner, Verizon..) to make it look legitimate. I have contacted the forum support team and this is happening to many forums over the last 2 days. Seems like they have an issue and are working on it. I will keep you informed as I learn more. One suspected area is adds being shown on the forum. I have made sure this has been turned off. When it happened to me, here is what I did that seems to have worked. 1. Message popped up on Chrome Browser. I had just logged onto the forum and had not clicked anything yet. 3. Selected the Process tab. 4. Click on each occurrence of your browser and the select the End Process button on the bottom of the screen. 5. Remove all the browsers, in may case Chrome.exe. 6. This shut down Chrome. 8. Everything seems to be working. I can navigate the forum so far with no issues. 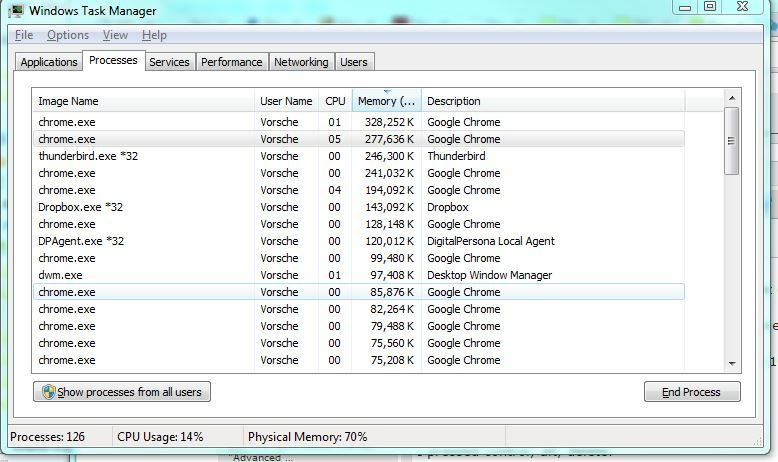 Here is a picture of the Task Manager. If any members know how to combat this please post here and help us out. I will keep everyone posted on what the forum support team finds out. i havent had an issue with my pc, however i had one pop up on my phone saying my android device was damaged, call number, download program to fix it, etc. i managed to get it closed and have had no issues. another forum im on (cobaltss.net) had the same issues, they found the source was from the ad bot that runs on the site. the ad company was unknowingly hosting ads that the owners were running malware in. Forum Support has identified the Add Provider and fixed the problem. Let me know asap if you encounter the issue again. I have turn off adds, I had them off before but I have to pay for that feature and it had expired June 15. They only let me turn off for 12 months. My apologies for any issue that this has caused anyone. Thank you Sharkey for you input. I posted you comment yesterday and I am pretty sure this got the support team over the hump. » BEWARE TUBERS GREAT WHITE SHARKS SPOTTED IN OUR LOCAL WATERS!!!! » FBI suspected Ali vs Liston was fixed?